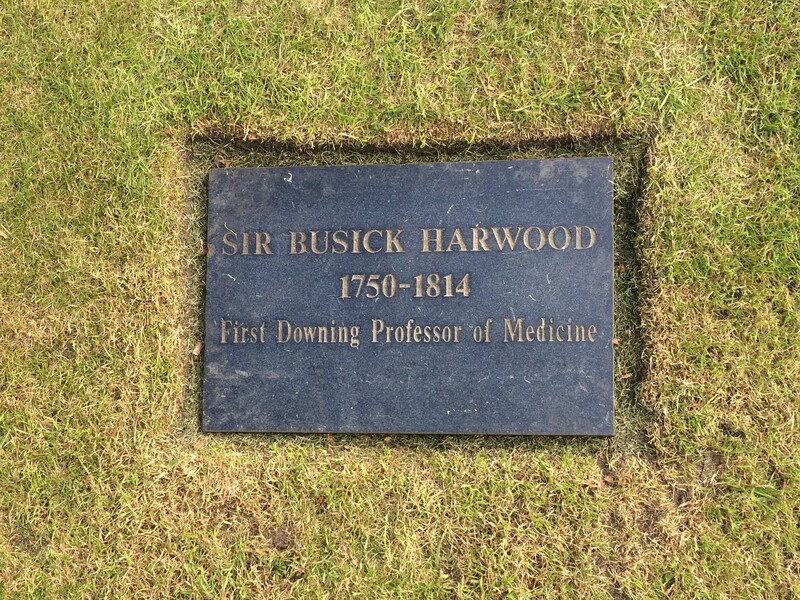 Two hundred years ago, Downing College's first Professor of Medicine, Sir Busick Harwood, died on 10th November 1814. He was named in the College's founding charter in 1800, one of only five Professors and Fellows of the new College, and was Vice-Master from 1812. Harwood was the first resident in Downing, moving into the East Lodge following its completion in 1811 (when only the Master's Lodge and East Lodge had been built and the College was still six years away from admitting its first student). He is a significant figure in the history of the College – and its archive– for two very different reasons: his art collection and the circumstances that followed his death in College in 1814. Busick Harwood was born on 27th November 1750 and, after training as a surgeon and serving for five years in India, he returned home in 1778 and entered Christ's College as a Fellow-Commoner the following year. In the early 1780s he helped establish the medical college at the London Hospital, where he had trained before leaving for India, and gave a series of well-received lectures in Botany. In 1782 Harwood obtained an MD by examination from St Andrews University and was elected a Fellow of the Society of Antiquaries the following year. He was elected a Fellow of the Royal Society on 22 April 1784 and graduated MB from Cambridge with a thesis on blood transfusion in 1785. That year, he was appointed Professor of Anatomy at Cambridge, becoming a physician at Addenbrooke's in 1786. Harwood moved to Emmanuel College, graduating as MD in 1790, and it was during his time there that he commissioned a series of watercolour portraits of his Cambridge acquaintances, in patronage of the artist Sylvester Harding. Between 1790 and 1799, Harding painted over 140 miniatures of different members of the University. These were originally hung in Harwood's rooms in Emmanuel. (In his Reminiscences of the University, Town and County of Cambridge from the year 1780, Henry Gunning recalled: 'Harwood's room [in Emmanuel] was hung with portraits – in fact the walls were nearly covered. He became possessed of them in a somewhat singular manner'). An album containing 134 of these miniatures was deposited in the archive in the 1980s and extensive conservation work has recently been completed. The portraits provide a fascinating and amazingly lifelike picture of students in Cambridge in the 1790s. Sadly, as they were commissioned just before the College was founded, none of those featured are from Downing, but they are nevertheless a beautiful and important part of the archive collection. The collection has recently been made available online via the Cambridge University Digital Library. Perhaps the most interesting and lasting legacy of Sir Busick Harwood is a physical, if perhaps little-known, one. When he died on 10th November 1814, he presented the Master at the time, William Frere, with a major problem. He had made it known before his death, and confirmed in his will (in the College's archive) that he wished to be buried on the site of the planned College chapel (in Wilkins' proposed South Range, which was to be between the Master's Lodge and Hall). As a result, the Master hastily obtained a licence from the Bishop of Ely, on 12th Nov 1814, for 'the interment of the bodies of the members and inhabitants of the said College' in a plot of land 40ft long and 20ft wide, to the West of the Master's Lodge, 'which will form part of the foundation and site of the chapel hereafter to be erected'. The problem that the College's architect, William Wilkins, faced in the days following Sir Busick's death was the practical issue of building the vault in haste at possibly the worst time of the year. Letters from Wilkins still survive in the College's archive relating to the building of the vault, both before and after Harwood's death (archive ref: DCAR/1/2/2/6/1). Although Wilkins was already planning the dimensions and exact location of the vault in late October, Wilkins advises in a letter two days after Harwood's death: 'I do not think it would be safe to have the brickwork executed so late in the year, especially after the frost we have already experienced. If you think of filling up the excavation, I should advise that the remains of poor Sir Busick be placed in the centre and four stakes driven in at the angles of the coffin... and not to suffer the coffin to be sunk below the level of the intended pavement. Whenever it may be afterwards determined to build the vault the foundations for the walls etc may be dug without uncovering the coffin until its proper catacomb be prepared for it. If poor Matthews' remains are to be removed they may be likewise deposited by the side'. (The reference to Matthews relates to Charles Skinner Matthews, Downing's first elected Fellow and friend of Lord Byron, who had drowned in the Cam (in what has become known as 'Byron's Pool') in August 1811. He was buried beneath the porch of St Bene't's Church in Cambridge, where a memorial tablet still hangs, and there is no apparent evidence that the suggested plan to move his remains to the vault at Downing ever took place). The College evidently went ahead with Wilkins' suggestion to complete the vault after the burial of Harwood. In a letter from Wilkins on 26th November, he writes: 'With regard to the propriety of beginning upon the work before next Spring, I do assure you I think it will be extremely hazardous. This alternating of frost and wet is highly prejudicial to brick work, especially under the circumstances of the case. Nevertheless, if you should determine to run the risque (sic), I will take every precaution to guard against the attacks of the weather'. The Cambridge Chronicle and Journal reported on Friday 16th December that 'the remains of Sir Busick Harwood were interred in the site of the future chapel of Downing College...the place of interment is about to be formed into a vault under the [site of the future chapel] – The funeral took place on Thursday the 15th ult. and was attended by all the residents in Downing College, as a tribute of respect in his memory'. The site of Sir Busick's grave in College remained unmarked until 1987, possibly because it was not until 1953 that the College's chapel was finally built, but on the opposite side of the quadrangle to Wilkins' original plans. A black marble memorial stone now marks the location of Sir Busick's resting place and can be found to the side of the path between the Master's Lodge and the Hall. On Friday 14th November, to commemorate 200 years since the death of one of the College's founding members, Dr David Pratt read a poem by Lord Byron (Churchill's Grave: a Fact Literally Rendered) at his graveside. It was a moving ceremony on a clear autumn evening, lit only with candles, attended by the Master, Senior Bursar and other Fellows. Downing's first Professor of Medicine may have died before he could see the completed College and the admission of its first students, but the plaque in the grass between the Master's Lodge and the Hall is a lasting reminder of his final wish to remain in College, and the existence of the vault beneath the chapel that never was. Download the information sheet on Sir Busick Harwood. 2) Memorial stone marking the site of the vault and Sir Busick's grave, by the Master's Lodge, Downing College.